Reinforcing plate prevents damage to 6" x 8" wood crossarm from tightened nuts. The design has a pressed rib and is normally used on the side of the crossarm. Reinforcing plate prevents damage to the crossarm from tightened nuts. 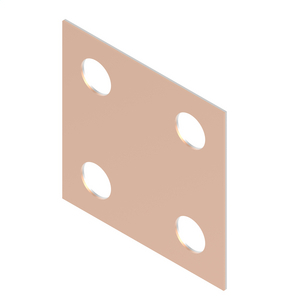 Plate is used on top or bottom of flat top crossarms to reduce the strain from forged steel insulator pins. Reinforcing plate prevents damage to 4" x 5" wood crossarm from tightened nuts. The design has a pressed rib and is normally used on the side of the crossarm. Double arming plate 4" wide x 24" long. Used for double arm construction in cases where no extension beyond the arm is required. Attaches to the crossarm through the slots provided. Double arming plate 4" wide x 17" long. Used for double arm construction in cases where an extension beyond the arm is required. Attaches to the crossarm through the slots provided. 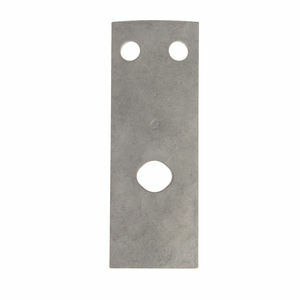 Lift and Load Plate 2 1/2" x 7" x 1/4" thick three hole style. Used to protect poles on heavy down guying when Thimbleye®, Angle-Thimbleye® or Oval-Eye bolts are used through the pole. 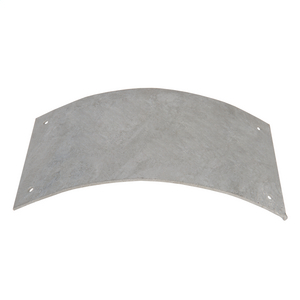 Lift and Load Plate 2 1/2" x 7" x 1/4" thick two hole style. Used to protect poles on heavy down guying when Thimbleye®, Angle-Thimbleye® or Oval-Eye bolts are used through the pole. 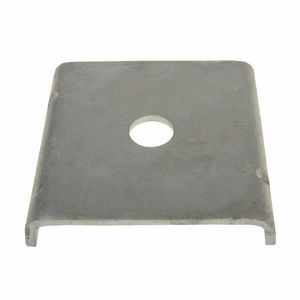 Lift and Load Plate 2 1/2" x 7" x 3/16" thick two hole style. Used to protect poles on heavy down guying when Thimbleye®, Angle-Thimbleye® or Oval-Eye bolts are used through the pole. 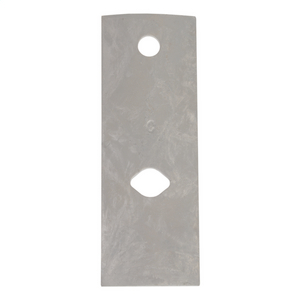 Lift and Load Plate 2 1/2" x 7" x 3/16" thick three hole style. Used to protect poles on heavy down guying when Thimbleye®, Angle-Thimbleye® or Oval-Eye bolts are used through the pole. Strain Plate 4" wide x 8" long is used in wrapped guy applications to prevent pole from being damaged by guy wire. Four nail holes at each corner are 3 /16" diameter.